#InlandWaters - Combined mooring and passage permits and extended mooring permits for the Grand Canal, Royal Canal and Barrow Navigation for the 2019 season are now available online from Waterways Ireland. All permits will run until Thursday 31 October, with annual renewal on 1 November each year. Applications require a photo of the vessel and a copy of its insurance (third party minimum). Applicants can decide to print their own permit or have a hard copy sent by post. Submitted applications will receive an acknowledgement email, and once approved, an online link will be emailed for payment. Questions regarding the application process can be forwarded to the inspectorate at [email protected] or by phone to 09064 35690 (9am-12pm Monday to Friday). #HistoricBoats - Waterways Ireland is seeking tenders to restore a legacy canal barge as an office space for Dublin’s Silicon Docks. According to the tender document, Waterways Ireland intends to clean out the vessel, further inspect its structural condition and convert it into “an open plan office for 6 workers with galley, meeting room and WC”. The vessel would be moored at Grand Canal Basin alongside other similar floating work spaces. It will also be self-propelled to enable it to move to other locations within the inland waterways network, and as such a P2 passenger boat licence will be required. The Heritage Boat Association has more details on the barge, which was extensively rebuilt in at Shannon Harbour in a community project from 1996 to 2003 and renamed Cluaine Uaine Bheag. Originally built as a general motorised trade boat by Vickers for the Grand Canal Company in 1928, the barge – then known as 48M – would have carried Guinness and other cargo until the canal’s commercial closure in 1959. Waterways Ireland has advised that due to the heat wave water levels on the Grand Canal system are low on many levels, particularly East of Tullamore in County Offaly. The Inspector of Navigation, Patrick Harkin, says owners and masters of vessels navigating these areas should do so 'with caution'. #InlandWaters - Waterways Ireland wishes confirms that no further boat movements will be organised into or out from Dublin east of Lock 12 on the Grand and Royal Canals until the 2018 season. The Grand Canal will shortly be closed for works in the Bluebell area in Dublin, and water levels will be reduced for the winter season. Waterways Ireland apologies for any inconvenience this may cause its customers and thanks their customers for their understanding in this matter. #DublinPort - A new public transport bridge for Dublin’s south quays will receive more than €15 million under a new State infrastructure scheme to encourage new housing. As TheJournal.ie reports, the proposed Dodder Bridge would span between Britain Quay and York Road at the confluence of the River Dodder and the Grand Canal — creating a more direct link between the city and the Poolbeg Peninsula, which has been designated as a Strategic Development Zone. The move has not been welcomed by the boating community, however, as WM Nixon noted on Afloat.ie last month how such a bridge would cut off access to the Grand Canal Basin for all but the lowest clearance ‘canal boats’. The news also comes after the Dublin Port Masterplan’s own proposals for a new north-south bridge immediately east of the Tom Clarke East Link Bridge at York Road, as previously reported on Afloat.ie. #GrandCanal - BreakingNews.ie reports on the recovery of a body from the Grand Canal in Dublin yesterday (Sunday 18 December) in the search for a missing man. The body was recovered by the Garda Water Unit at lunchtime yesterday near Harcourt Terrace in the city centre during the search for 25-year-old Mehdi Hasan, who was last seen in on Leeson Street around 4am on Friday morning (16 December). The inland waterways of Co Kildare comes to life this coming October Bank Holiday weekend. Inland Waterways Association of Ireland (IWAI) Kildare will host it’s now annual Naas Canal Festival from Friday October 28th to Monday 31st. A large fleet of boats is expected to assemble in Sallins harbour on Friday followed by a parade along the Grand Canal, up through the flight of five locks into Naas harbour. The parade will leave Sallins at 11am and all boats should be in Naas harbour by 5pm. In the spirit of the founders of the IWAI, who established the Association in 1954 to campaign against the installation of fixed span bridges across the River Shannon, IWAI Kildare will use the Naas Canal Festival to showcase the leisure potential of the Grand Canal in this area. Whether your passion involves travelling through locks by boat, paddling a canoe, walking or cycling for health, well being and enjoyment or waiting patiently for a bite on your fishing line, IWAI Kildare invites you to immerse yourself in the amazing engineering achievement that is the Grand Canal. IWAI Kildare was established in 1984. In the early years IWAI Kildare was assisted by IWAI Dublin to restore and enable the re opening to navigation of the Naas branch of the Grand Canal main line. Currently, IWAI Kildare aims to promote the use of the waterways of Co. Kildare by running rallies all over the county. IWAI Kildare is actively campaigning to re open the Corbally branch of the Grand Canal from Naas harbour to Corbally harbour. This stretch of waterway is in good condition but passage for boats is blocked by a number of culverted crossings, including the road from Naas to Newhall which crosses the canal near Jigginstown. The salvage and disposal of a number of sunk and abandoned vessels from the Barrow Line of the Grand Canal at Lowtown took place on 12-13 October 2016 by Waterways Ireland. As part of the canals clean up a number of sunken and abandoned, non permitted, vessels were targeted for removal and disposal from the canals. Every effort was made to trace owners of the vessels via the permit database, Shannon Registration number or local knowledge. No owners or interested parties were found. Upon inspection of all vessels by the Assistant Inspector of Navigation, it was determined that none of the vessels were salvageable and were beyond economic repair. Consequently it was decided to remove and dispose of the wrecks. A company was contracted to undertake the work. The first vessel, a steel hulk has been sunk on the Eastern bank of the Barrow Line for approximately 5 years. Accumulated debris and rubbish hindered the pump out but eventually the vessel was floated. The vessel was recovered onto the canal bank after 7 hours of work. As initial cuts with cutting equipment were made, Waterways Ireland received a request from Heritage Boat Association to pause the removal of the vessel as it potentially had heritage value. No further cutting was done and the hulk has been left on the canal bank, overturned to prevent further ingress of water, while the HBA's interest is followed up. Removal of the other vessels went ahead as planned. Most vessels broke up as they were being towed to the Western bank for disposal. A diver in the water recovered all floating debris and heavy materials were recovered with the assistance of a digger bucket. 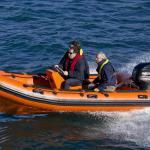 One vessel was pumped out and returned to its owner who was identified after a number of phone calls on 13th October. Vessel removal was completed on 13th October with contractor returning on site on 14th October to "dress" the bank and remove any remaining debris. Waterways Ireland requests owners of boats on the Grand Canal, Royal Canal and Barrow Navigation to ensure they have a valid permit and that the Inspector of Navigation has been provided with up to date contact details.